The house is positioned between Church bay and Cemlyn nature reserve. and is in easy reach of the breathtaking walks along the coast of Anglesey, steeped in Welsh history and natural beauty. The house itself sits in a beautiful mature enclosed garden; large off lane parking with an orchard. 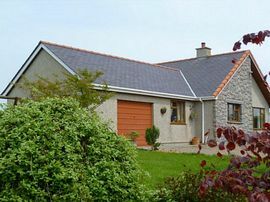 It has five spacious bedrooms of which three are double, one kingsize and a single.The house has broadband, a lounge with Free Sat, flat screen TV and DVD player. There is a childrens den with Free Sat TV and games. The kitchen is spacious and fully equipped. Carpeted garage is attached with a W.C.
Large family bathroom downstairs plus a beautiful en-suite in one of the double rooms upstairs. Close to Cemlyn, a natural nature reserve, home to many species of birds. this part of the coast has something to offer everyone, from hill and coastal walking, to water sports on some of the glorious beaches of Anglesey to sitting back and admiring the scenery and watching the wildlife. This house has something to offer everyone, close to beaches, coast restaurants, pubs and golf club. Babysitting and beauty therapy services. Catering and walking guide services . Local Services: nearest village is cemaes bay 5 miles, has local amenities butcher, baker, doctor and shop. All year round lets: Low season £350 Mid season £450-£500. High season £750, plus discount for longer month lets. Open all year. Change over day is Saturday.